In nature, Chlorophyta (Green Algae) is a phylum of photosynthetic Eukaryota empire bearing a double membrane-bound plastids containing both chlorophyll a and chlorophyll b, primarily living in a variety of aquatic habitats. In nature, Green Algae (Chlorophyta) are a large group of primarily aquatic plants in the Kingdom Plantae (Plants), that include the divisions Chlorophyta and Charophyta. 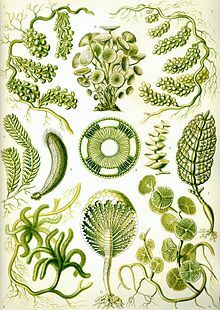 The green algae include unicellular and colonial flagellates, most with two flagella per cell, as well as various colonial, coccoid, and filamentous forms, and macroscopic seaweeds. Many species live most of their lives as single cells, while other species form colonies, coenobia, long filaments, or highly differentiated macroscopic seaweeds. In nature, Chlorella is a nonmotile single-celled (unicellular) water-grown green microalgae that contain a nucleus and an enormous amount of readily available chlorophyll. Chlorella is a complete food as a source of high-grade protein and B-complex vitamins, considered to be superfood. Chlorella is composed of about 58% digestible protein, and carbohydrates. Chlorella contains all of the B vitamins, vitamins C and E, amino acids, beta-carotene, iron, zinc, macro-minerals such as calcium, magnesium, zinc, potassium, rare trace minerals, essential fatty acids including GLA and polysaccharides.